Do Eagles and Vick Already Have a Deal in Place? I’m not sure I’ve ever seen a player and a team so united over the use of the franchise tag as Michael Vick and the Eagles seem to be. Often those relationships can be heated. Yet, somehow, for a player-team marriage that started two years ago with a tentative tryout, the Eagles and Vick have entwined their interests to the point where both parties appear to be on exactly the same page. Here’s a player who could get tens of millions on the open market, but happily signed his tender almost immediately. He didn’t care about the looming lockout, lack of a long term deal, or the potential elimination of the entire franchise player designation. Nor did the Eagles seem at all worried that Vick might leave. Even the Colts are worried about losing Indianapolis institution Peyton Manning, but the Eagles are fully focused on trading Kevin Kolb (their only insurance policy). Why are the two parties so seemingly content? I can think of only one good enough reason: Vick and the Eagles already have a handshake deal on a new contract extension. If they already have a deal in place for whenever the new CBA comes together, that would free up the Eagles to pursue the rest of their business, like trading Kolb worry-free. And Vick could rest easy knowing that he’s set even beyond his large one-year contract. Sure, both sides could be faking it. But look back to last offseason, before Vick revealed himself as the second coming. Vick was mouthing off in the media, talking about how he wanted to be the starter somewhere and mentioning other teams. 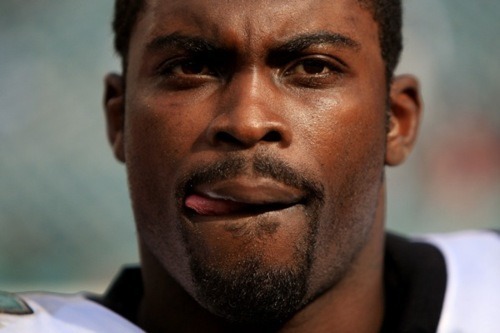 And the Eagles somewhat actively shopping Vick as well. I wrote a round-up of those rumors at the time, and although the conclusion was off, the evidence was solid. That’s what it looks like when Vick and the Eagles aren’t on the same page: quotes to the media, anonymous reports about trades and contracts, etc. This time around, it’s in both sides’ best interest to work out a long term deal. Vick likes it in Philly — and why wouldn’t he with Andy Reid around and DeSean Jackson and company as weapons. The Eagles can’t afford to let one of the best and highest-profile players in the NFL just walk out the door. If they hadn’t already come to an agreement, I think there would be some grumbling. Maybe nothing overt, but at least some media speculation and background sources to try to gain leverage in negotiations. In this case, the absence of any of that conflict may be quite revealing. Tagged with Philadelphia Eagles, Michael Vick, Kevin Kolb, Trade, Trade Rumors, Contract Extension, Contract Rumors, Andy Reid, DeSean Jackson, NFL, 2011, Offseason, Rumors. May 11, 2011 by Brian Solomon.